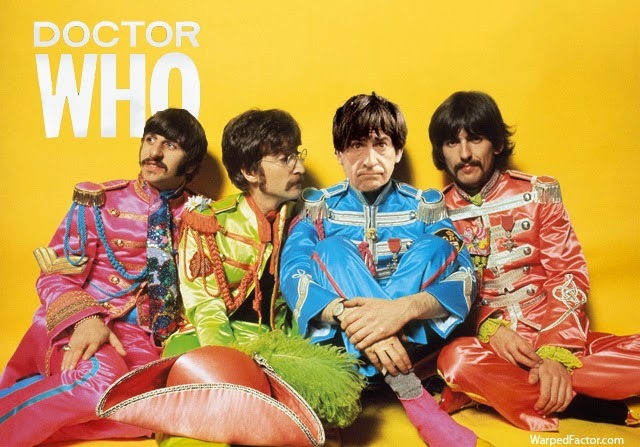 Doctor Who: SGT TROUGHTON'S TARDIS FAN CLUB BAND | Warped Factor - Words in the Key of Geek. The American mythologist Joseph Campbell once wrote a book with the rather grandiose title of The Hero With A Thousand Faces. 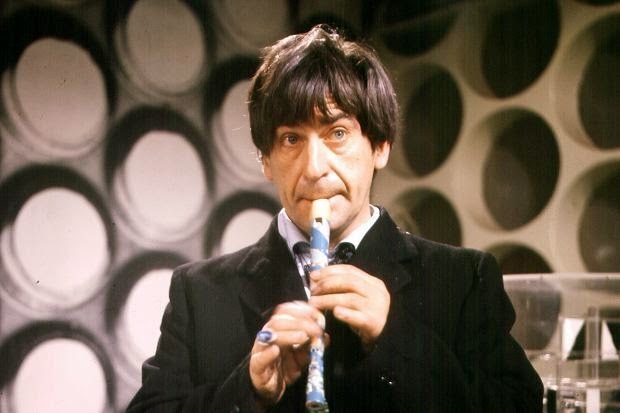 Whether Patrick Troughton - born on March 25th, 1920 - had a read before stepping into the TARDIS to take on the role of the Second Doctor in 1966 remains unrecorded. But there are many facets to his performance! Was he simply a scruffy little clown with a fondness for the recorder? Or was this all a clever ruse, allowing him to focus on the real work of scheming to defeat the many terrible things bred in certain corners of the universe? However you read into his three years in the role, he must have done something right. For a number of the actors who have gone on to follow in his path cite his take on the part as influential, including Peter Davison, Colin Baker, Sylvester McCoy & Matt Smith, whose decision to don a bow tie as the Eleventh Doctor was in part a tribute to the man he became a fan of after watching Troughton in The Tomb Of The Cybermen. "The producer asked about staying beyond a third year and I said I would call it a day because that had been my plan, as suggested by Patrick Troughton. Do three and get out, he said. I stuck with that. I had a chance to change my mind, but I thought that would be chickening out, and there were other things I wanted to do." Before that, though, he got the chance to appear with the man he called "my favourite Doctor" in the 20th anniversary special The Five Doctors. 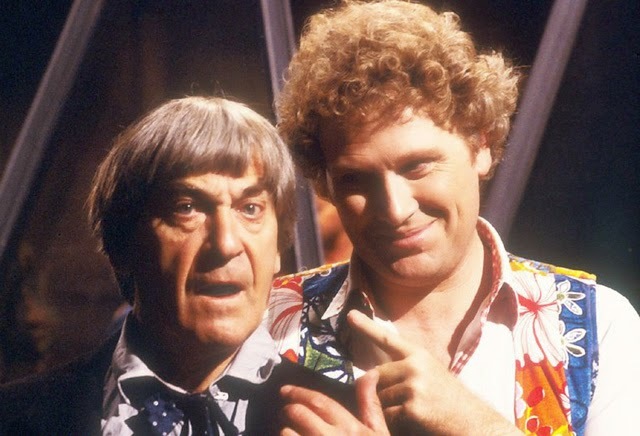 "I most enjoyed doing ‘The Two Doctors’, because of working with Patrick Troughton and Frazer Hines. Pat, I’ve adored for many years, and I’ve known him for a long time. I was best man at his son David’s wedding, and I shared a flat with David for ten years, so I’ve known Pat off and on, and always admired his acting, and adored his Doctor, so to actually work with him was a special treat. I was a bit in awe, actually, but that was dispelled in a couple of days, and Frazer also is a delight. Frazer and I got on extremely well, and we larked around a lot, and Pat treated us like an affectionate… I’d say father… but he’d be offended." The pair even had nicknames for each other! "...he calls me Miss Piggy at the moment; I call him Gonzo." 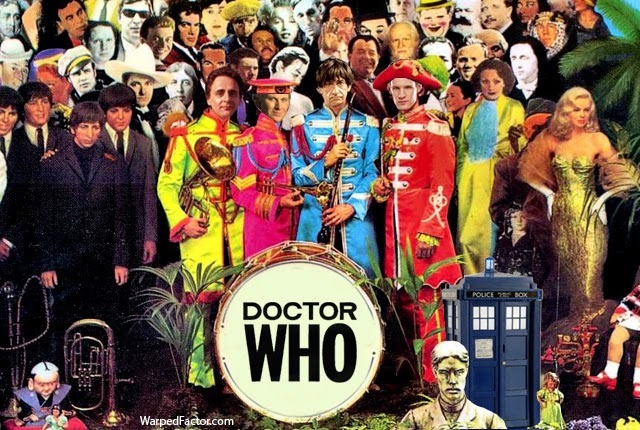 And then there's Matt Smith. A newcomer to the wonderful world of Doctor Who, after accepting the role of the Eleventh he found himself a rather wonderful guide. 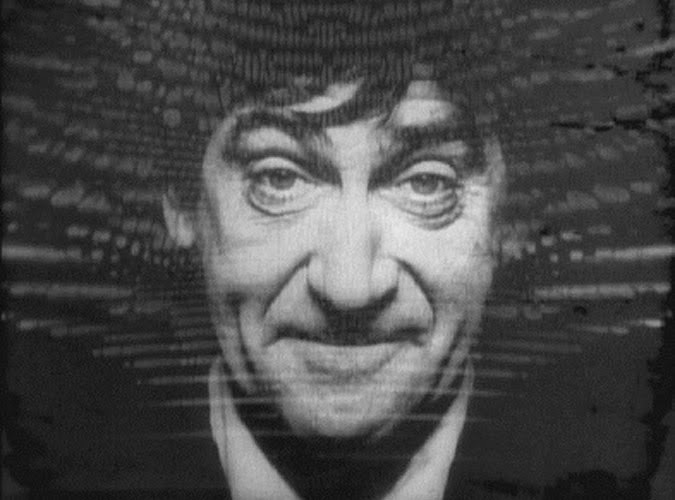 "What I think is wonderful about Troughton is he's weird and peculiar but he never asks you to find him weird and peculiar. He was a great actor"
Matt would go on to write the foreword to Michael Troughton's biography of his father, in a wonderful gesture! 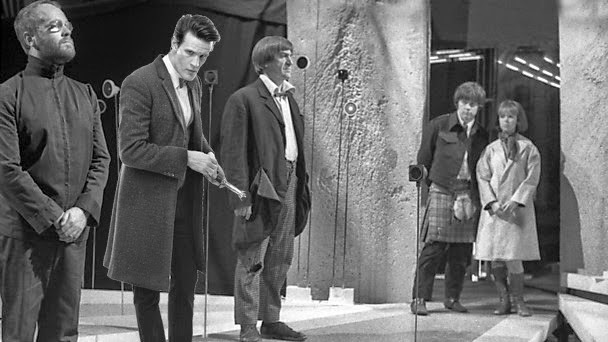 Perhaps in light of this the similarly bow-tied Doctor found himself facing off against a number of enemies he'd first encountered as the younger man- the Ice Warriors & Great Intelligence returning to pick up where they'd left off in The Ice Warriors/ The Seeds Of Death & The Abominable Snowmen/The Web Of Fear respectively in Cold War & The Snowmen/The Bells Of Saint John. "...a love-letter to those Troughton stories that so often saw a group of desperate, frightened people under attack from an alien menace. A “base under-sea” if you like." 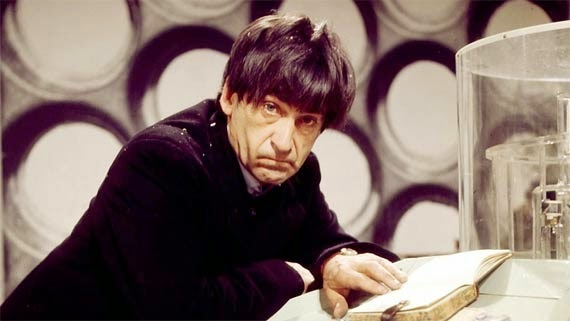 "The correct answer to ‘who is your favourite Doctor?’ is always 'the one with two hearts'. But Patrick lays down the central rules for the character. Doctor Who doesn’t change much afterwards. You don’t tamper with perfection. Once Patrick comes along, they tailor the part to the personality of the actor; the Doctor is changed to fit them." "I would argue that Patrick Troughton was one of the most important and influential Doctors, [and] I'm not just saying that because he's ''my'' Doctor." He knows he's not the only one to praise Pat so highly, too! But what did the man himself make of his craft? "I believed totally in the possibilities implied in the series. I never thought of it as fantasy. Far from it. When you’re a character actor you’re having to make decisions all the time, and that’s a question of gaining confidence in the part you play, and that takes the time, really. Whereas with ‘Doctor Who’, the three years of it, you weren’t learning lines, really, you were learning thoughts." Clearly he was an excellent student! He would later recall the process of getting the part. "I think this Doctor listens to everyone, tots it all up and then makes his own decision about this. Then in comes Sydney Newman, and he starts talking about this cosmic hobo, who obviously doesn’t talk like an intellectual type, autocratic Sherlock Holmes at all. And I leapt at it, what a good idea, and I said ‘A man like that would be more of a listener, wouldn’t he?’, and they said ‘Yes’. So that’s how that came about, really. I was very keen on doing it like that, because to begin with I found myself playing it over the top, mostly because that’s how Sydney Newman was urging me to play it. But Shaun Sutton, who I think was a little wiser than Sydney Newman in many ways, in fact considerably wiser, he said ‘No, no, just do it in your head, old chap’, so I toned it down a bit after that and it was warmer and a bit more successful." "Michael Craze was responsible for me wearing that absurd Beatles cut, he and Anneke Wills. Just before we went on, we got down to make-up and I’d had a lovely wig fitted- and I put it on, and they both looked at me and said ‘You look like Harpo Marx and we’re not going on with you in that wig’, I said ‘Don’t be ridiculous’, they said ‘No, sorry, no’. So they took if off and started doing things, combing it and lifting it and all that, and I ended up like the Beatles." Hey you awesome geek, you. Why not be our friend on Twitter and Facebook. Words in the key of geek! 1975 - A Vintage Mint In Box Mego STAR TREK Transporter, Hot Darn! The Cast Of “Las Vegas”: Where Are They Now? Has ARROW broken 'The Curse Of SUMMER GLAU' ? All logos and images used on this website are registered trademarks of their respective companies. All Rights Reserved. Some of the content presented on this site has been provided by users, Warped Factor is not liable for inaccuracies, errors, or omissions found herein. For speedy removal of copyrighted images, trademarks, or other issues, Contact Us.